Turning the key to any vehicle and finding a dead battery is not a desirable situation. However, with the right amount of foresight and the right equipment, this situation can be avoided. A commercial battery charger is a powerful device characterized by enough strength to charge a fleet of vehicles, vehicles in need of repair, dealership vehicles, construction equipment, and then some. It is commonly used in service repair shops, industrial outlets, and dealerships. Choosing the right battery charger means seeking the ideal combination of powerful performance and versatility. Commercial battery chargers can address needs for various industries, particularly for those looking to charge a variety of vehicle types in a fleet. Searching for the right charger includes deciding between key features and elements before making an investment in the equipment. Very few models are “the complete package” and combine versatility and power in a strong way. The Associated Equipment Amp Charger with Cranking Assist is one of those few models. It is among the highest performance chargers currently on the market. This charger packs a powerful punch thanks to its durable transformer. It has fully insulated clamps with flexible spring clamps providing 500 amps. It is also able to provide up to 80 amps of continuous charge and a 400-amp cranking assist. With a patented “Sub-Sil” multi-diode rectifiers and AC cord/DC leads, the charger lives up to its reputation for high performance. 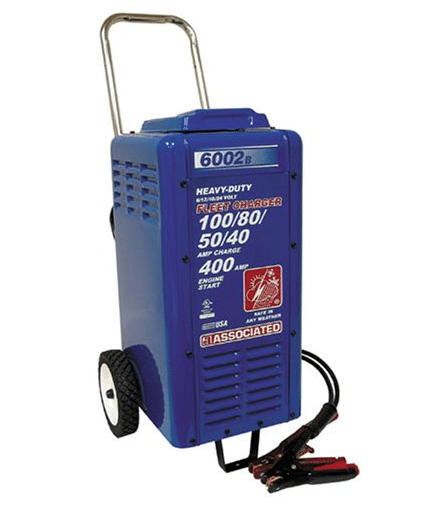 The Associated Equipment Amp Charger is very durable and able to operate safely in any weather. At the same time, it has wheels and a chrome plated handle to allow for transportation. The 7-inch wheels are also necessary to handle the weight of this 70-pound charger. The goal with any commercial battery charger is to find a tool able to reduce industrial worries. This charger comes with several aspects designed to achieve just that. The analog display enables clear and easy tracking of amps and charge. This charger is able to avoid overheating through its cooling fan. Fans also increase the longevity of battery charger usage. The automatic timer also allows for timed operation without a need for continuous monitoring. A stop/go light further increases the safety features of this unit. It also has an automatic reset for AC/DC circuit breakers. This amp charger from Associated Equipment has a great reach as well. The power cord is 10 feet in length and accompanied by an 8 feet long connection cable. The reach allows for usage in tight spaces or in areas where the full unit cannot be set down. While voltage and power is great, breaking it down to the facts can be more useful in determining the right battery charger match. The wide range of features and proven high-performance capabilities total up to justify the cost of this unit. Despite the high price, it would be a commercial battery charger with long-term benefits and a longevity not frequently seen on the market. Industries with large fleets, like car dealerships, auto shops, construction companies, and more will be able to use this particular charger by Associated Equipment to address battery charging needs for quite some time. Whether this is your first time looking into a commercial battery charger, or you are searching for a replacement option, details are key in making a smart choice. 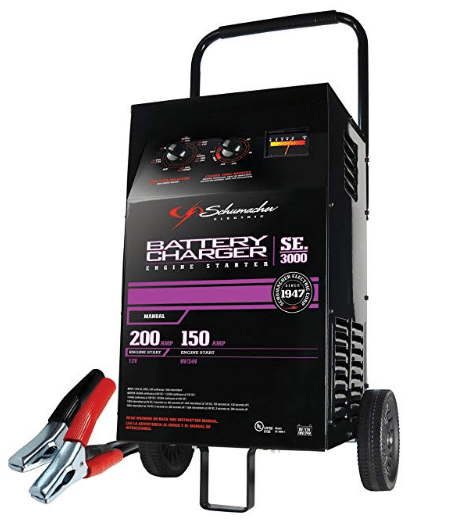 Commercial battery chargers are useful in various industries, from auto repair shops to car dealerships. A powerful battery charger will be able to charge an entire fleet of vehicles while offering other features potentially needed. 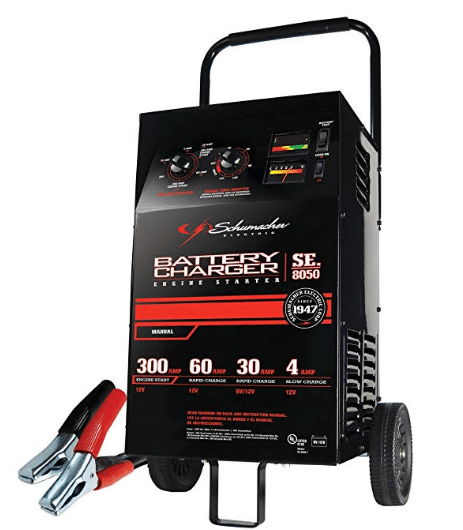 The Schumacher SE 8050 Amp Manual Charger with Tester is one such powerful option. This charger is able to charge both 6 and 12-volt batteries. With 30-amp rapid charge, either battery can be fully charged in 1 to 2 hours. It also features grooved wheels and a handle to allow for easy transport between vehicles. In addition to charging capacity and transport, the Schumacher has a tester to detect defunct batteries in need of replacement. The charger can also test alternators. The heavy-duty design makes it optimal for usage in large fleets and various industries. The engine start assist has a high-output that allows it to start most batteries in any condition. Start assist is useful if emergency or quick start is needed. The charger weighs in around 40 pounds, which is pretty standard on a powerful charger. The wheels and handle will make moving it around easy. Another option is to load onto a truck or flatbed and drive it to different vehicles. The load tester is able to test 50-amps on a 6-volt system or 100 amps on 12-volt. While voltage and power are great, breaking it down to the facts can be more useful in determining the right battery charger match. Potential buyers with industrial needs, specifically in the auto repair industry, may find a match in the Schumacher SE-8050. The 30-amp charge is able to accommodate both 6 V and 12 V batteries, perfect for working with a variety of vehicle types. The quick charge and start assist options provide a fast solution in various scenarios or conditions. Testing battery charge and alternator is a nice additional feature to eliminate time wasted on attempting to charge a dead battery. Overall, the Schumacher SE-8050 has the right amount of power and versatility to work with a range of needs. A wide range of industries find a need to invest in a powerful commercial battery charger. This investment requires consideration of amps, voltage, size, and more. An affordable price is also a great quality as well. 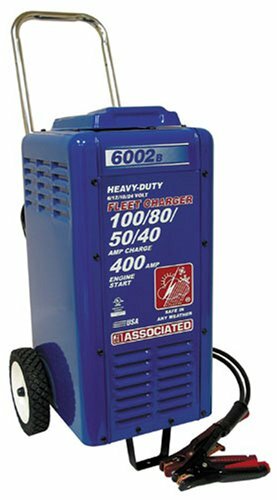 The Schumacher SE-3000 1.5-200 Amp Manual Fleet Battery Charger is a heavy-duty charger designed specifically for industrial and fleet usage. A unique feature of this charger is its ability to charge 6, 12, 18, and 24-volt batteries. Most standard chargers can only handle 6 or 12 volt batteries. 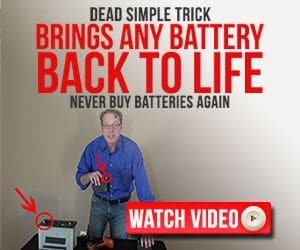 This model promises one purchase for a range of voltages rather than a separate charging unit for 18 and 24-volt batteries. Each voltage range also has a start assist to bring the engine to life in an emergency situation or when time is of the essence. The Schumacher SE-3000 also features wheels and a handle to allow for transport between vehicles. Since it weighs in at a little over 40 pounds, this is a convenient feature. The handle is also detachable. The unit comes with detachable feet as well, great for if the unit is intended to be stationary. 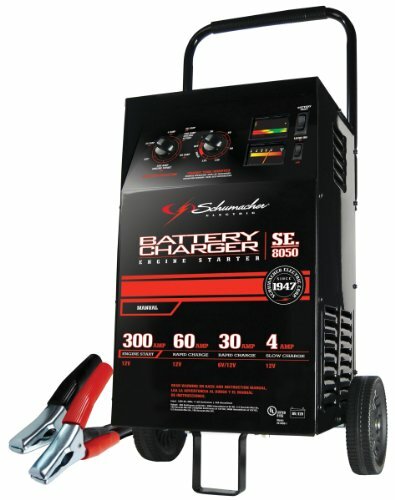 The Schumacher SE-3000 has a few features unique to it in comparison to other chargers on the market. It comes equipped with a rotary switch to allow for quick adjustment to each voltage range. With a “hold” option, a timer can be set to enable continuous charging. Additionally, a cooling fan extends the life of the battery and increases performance levels. To switch between voltage ranges, the charger adjusts necessary amp rates. The 6-volt battery uses a rate of 80-amp, 65-amp for 12 volts, 57-amp or 18 volts, and 30-amp for 24-volt. It has an input power of 120 V AC at 60 hertz. The maximum output is 200 amps. 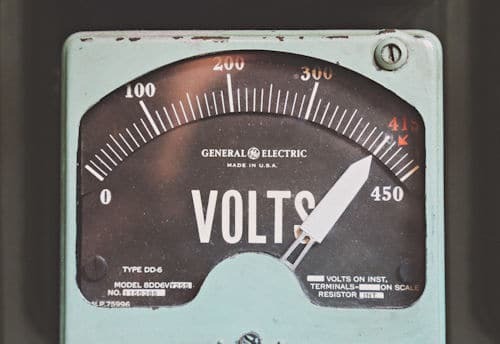 The amperage meter is color-coded and clearly displays the charge rate. The charger can be switched between continuous manual operation or a timed charged. The timer can be set for up to 2.25 hours. The time-specific feature creates a safe charging window and automatically switches off output when the clock runs out. The charging unit is encased in a durable steel case, enabling it to endure emergency or severe conditions. The case is attached to a 6-foot power cord, and the cable and clamps can reach up to 12 feet from the outlet. 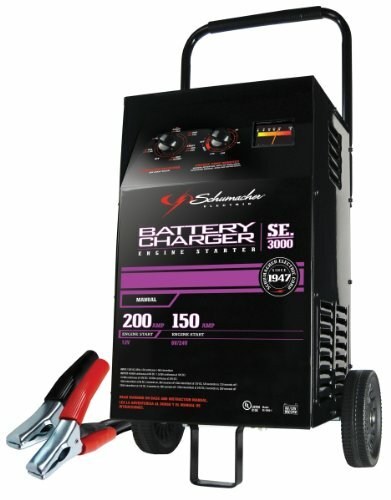 If the fleet features a wide range of voltage needs, consider investing in the Schumacher SE-3000. The single rotary switch gives a quick switch between battery types. The timed operation or manual setting allows for transitioning between situations. In terms of versatility, this unit is designed to be flexible to various needs. The power aspect means the charger can go from vehicle to vehicle and provide quick and reliable charging. Power is measured through the charging amps rating. This rating gives an idea of the rate the charger will be able to charge the battery. Desired ampere units will vary based on the needs. Chargers featuring 30 or 60 charging amps can be easily found. The higher level of amps translates to faster charging time, especially when compared to the typical 10-amp battery chargers available to consumers. Versatility pertains to the ability to charge different sizes and types of vehicles. Versatility is key because it means one purchase versus needing several battery chargers to address all vehicular needs. There are quite a few different commercial battery charger options on the market. Choosing the right one means understanding the charging needs of the vehicles in question and the desired industrial usage. There are different features to be considered in order to make the right choice and investment. Starting Assist – Some models have a start assist. This is useful if time is of the essence. The start assist powers up the vehicle without waiting for a full capacity battery charge. This is not standard on all models, so look out for it as an option. Check charger specifications to ensure it is equipped to start 6V and 12V batteries. Easy Transport – The charger has a large job, so it makes sense it is a large device. But this also means a powerful charger will be heavy. Hauling it from one vehicle to the next will quickly become draining. This is why checking for added wheels and handle will make using it easier. Wheels are essential if the charger needs to be transported. Battery Testing – Of course, sometimes it is not a question of charging the battery but rather of replacing it entirely. Some charging systems have the capability to detect if the battery is bad or unable to accept a charge. It will let you know when charging time really needs to be replacement time. Output Voltage – Battery voltage varies within different industries. It is possible to be working with 6V or 12V batteries, or both. Purchasing a charger means determining its capability of handling necessary battery voltages. One of the ways you can get the most out of your battery charger is to use it while reconditioning batteries. The money you save doing this instead of buying new batteries will help pay for a new charger in no time. The bottom line is to know industry needs and find the right match in the market of commercial battery chargers. Consider all elements, from wheels to manufacturer warranty and beyond.